Sabetha 28, Nemaha Central 8 – Sabetha avenged a 35-27 loss to Nemaha Central to open the season by beating the Thunder 28-8. Kegan Schumann rushed for a pair of touchdowns for the Blue Jays. Brett Plattner added more than 200 yards rushing and a score for Sabetha. Silver Lake 60, Maur Hill-Mount Academy 13 – Silver Lake led just 20-13 at halftime before routing the Ravens 60-13. Cody Renfro led the Eagles with 120 yards on the ground and three scores. Josh Caudle rushed for both Maur Hill touchdowns. Wellsville 52, Northeast-Arma 0 – Northeast’s first playoff appearance since 2002 turned out to be a short one as Wellsville rolled to a 52-0 win. The Eagles scored 24 points in the first quarter and 28 more in the second quarter. Wellsville will host Caney Valley on Saturday. Caney Valley 35, Riverton 27 – Caney Valley and Riverton traded the lead throughout the first half before the Bullpups grabbed a 21-12 lead at the break. Caney held on to defeat the Rams 35-27 and advance to a second round game at Wellsville. The Rams came up short in their first playoff game since 2010. Centralia 50, Horton 6 – Centralia won its fifth consecutive playoff game with a 50-6 blowout of Horton. The Panthers led 42-0 at halftime and cruised to their fourth straight win since falling to Rossville. The Panthers and Bulldogs will hook up again in the second round in Rossville. Rossville 56, Pleasant Ridge 0 – Rossville rolled to a 42-0 halftime lead in pasting Pleasant Ridge. The Bulldogs put up more than 500 yards of total offense led by Tucker Horak’s 105 yards rushing on our carries. He also passed for 160 yards and three touchdowns. St. Mary’s Colgan 46, Jayhawk-Linn 7 – Colgan scored 29 points in the second quarter to pull away from the Jayhawks. The Panthers scoring included a safety and three field goals; two in the final minute of the second quarter. After a Colgan field goal, Jayhawk-Linn fumbled the ensuing kickoff setting up another Colgan field goal attempt before halftime. Galena 26, Neodesha 0 – Galena won its fifth consecutive game, but it may have proved costly. Galena’s Gabe Helton, Logan Johnson, and quarterback P.J. Sarwinski all left the game with injuries and did not return. The Bulldogs will host Colgan on Saturday in a rematch of the season opener won by Colgan 16-12. Chaparral 47, Leon-Bluestem 14 – Chaparral led 26-0 after one quarter and rolled to a 47-14 win. Shawn Nulik led Chaparral with five touchdowns in the first half alone. It was the second win for the Roadrunners over the Lions this season. Halstead 54, Southeast of Saline 13 – Halstead had a huge night on the ground in blowing out Southeast of Saline. The Dragons got 259 yards rushing and five touchdowns from Eli McKee, while Blake Beckett added 208 yards and two scores on the ground. Minneapolis 59, Beloit 34 – Minneapolis topped Beloit for the second time this season, but this one had a little less drama. After winning 27-26 in overtime earlier this season, the Lions won by 25 points on Tuesday night. The Trojans pulled to within 24-22 at halftime and 31-28 late in the third quarter before Minneapolis pulled away. Hoisington 48, Cimarron 6 – Hoisington rolled to a 41-6 halftime lead in routing Cimarron. Hunter Hanzlick rushed for nearly 200 yards and five touchdowns for the Cardinals. Hoisington will travel to Minneapolis on Saturday. Wichita Collegiate 56, Conway Springs 34 – Collegiate overcame a 28-7 deficit to race past Conway Springs 56-34. Conway Springs got a pick-six and a fumbled kickoff from Collegiate to score two of their first-half touchdowns. Collegiate then scored five touchdowns in the third quarter to take control. Jaques Williams rushed for nearly 250 yards and five touchdowns, caught a touchdown pass, and threw for another score. Hesston 42, Hutchinson Trinity 28 – In a game that saw four ties and four lead changes, Hesston scored the final 21 points to claim a 42-28 win over Trinity Catholic. Grant Raleigh and Collin Martin each rushed for three touchdowns to pace the Swathers. David Thaibault scored three touchdowns for the Celtics. Norton 49, Riley County 14 – Norton remained unbeaten with a 49-14 win over Riley County. Jordan Dole passed for an early touchdown and rushed for another as the Bluejays built a 28-0 halftime lead. That lead grew to 49-7 late in the third quarter before the Falcons scored again. Scott City 56, Ellsworth 0 – Scott City left little doubt about who would be advancing in this one as the Beavers scored 35 points in the first quarter. Wyatt Kropp needed just three carries to manage 146 yards and two touchdowns, while Cooper Griffith carried seven times for 133 yards and two scores. Marais des Cygnes Valley 42, Cedar Vale-Dexter 34 – In one of the closest games of the night, Marais des Cygnes Valley held a slim 26-20 lead at halftime and held on. The Trojans will now travel to Osborne for a second consecutive season. Osborne won the 2013 match-up 68-52. Osborne 66, Peabody-Burns 44 – Defending-champion Osborne built a 24-8 lead after one quarter before Peabody-Burns rallied to pull within 30-28 in the second quarter. The Bulldogs added two touchdowns before half to take a 44-28 lead. Osborne outscored the Warriors 22-16 the rest of the way for the win. Udall 62, Uniontown 12 – Udall improved to 10-0 after rolling past Uniontown 62-12. The Eagles turned an early Uniontown fumble and interception into touchdowns in building a 22-0 first quarter lead. That lead grew to 42-6 by halftime. Hanover 70, Madison 22 – Hanover turned two early Madison turnovers into a 28-0 lead and cruised to a 70-22 win over the Bulldogs. Wildcat quarterback Andrew Bruna rushed for 130 yards and four touchdowns and passed for 130 yards and two more scores. Owen Reed led Madison with 171 yards rushing and three scores. Central Plains 50, South Central 14 – Central Plains eliminated South Central in the first round for the second consecutive season. The Oilers held a slim 14-0 lead at halftime before expanding it to 30-8 at the end of three quarters. Spearville 52, Atwood-Rawlins County 14 – Spearville led 14-6 after one quarter, but expanded that lead to 30-6 by halftime. Spearville took control with a 22-8 second half to win 52-14. The No. 2 Lancers improve to 10-0 and will travel to No. 3 Central Plains on Saturday. Little River 62, Pratt-Skyline 14 – Little River raced out to a 34-8 lead in the first quarter and rolled past Pratt-Skyline. The Redskins held Skyline to just 99 rushing yards on 31 carries and 122 yards of total offense. Ness City 36, Oberlin-Decatur Community 32 – Tanner McMillan rushed for two touchdowns and passed for another as Ness City built a 22-8 halftime lead and held on to beat Decatur Community. The Eagles stopped the Red Devils at the goal line just before halftime and Pedro Flores returned the opening kickoff of the second half for a score and a 28-8 lead. Ness City would extend their lead to 36-14 after three quarters before Oberlin would score twice more; the final time with five seconds remaining. Axtell 78, Sylvan-Lucas Unified 28 – Axtell routed Sylvan-Lucas Unified by 50 points to earn a date with No. 1 Chetopa. The Eagles led 50-12 at halftime and cruised to the win. The playoff appearance is Axtell’s first since falling in the state semifinals in 2008. Chetopa 76, Caldwell 54 – Chetopa built a 40-6 lead in the first half and had to hold off a late Caldwell rally to win 76-54. 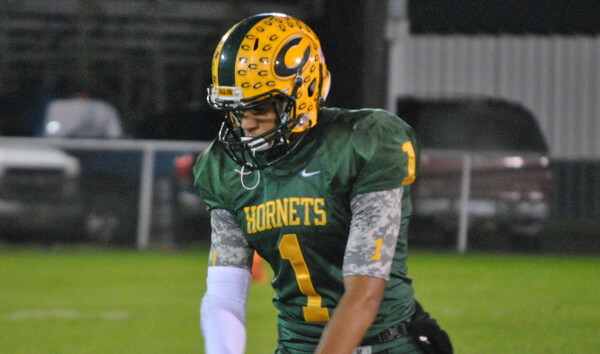 Sherrick Rogers hauled in six touchdown receptions for the Green Hornets. Rogers also made a one-handed interception at the goal line and returned it 79 yards for a touchdown, and returned a fumble for another score in the third quarter. Rogers had 13 total receptions for 254 yards. Pike Valley 58, Chase 34 – Despite coming into the playoffs with a 4-5 record, Pike Valley had battled through a competitive schedule and it showed on Tuesday night. The Panthers broke open a 14-14 tie to take a 36-14 lead into halftime and then answered two Kat scores with two straight touchdowns to build a 58-26. Argonia-Attica 84, Southern Coffey Co. 40 – These two Titans combined for 124 points in an exciting 8-man game. Argonia-Attica built a 24-0 lead before Southern Coffey County pulled to within 32-12. The lead grew to 30 points twice at 50-20 and 64-34 before A& A expanded their lead in the fourth quarter. Minneola 44, Satanta 32 – Joey Harrington rushed for more than 250 yards as Minneola held off Satanta 44-32. The Wildcats converted three Satanta turnovers into touchdowns which proved to be the difference in the game. Harrington passed for a touchdown to Cody Berger for another Minneola score. Victoria 34, Hoxie 20 – Victoria rallied from a 12-0 second-quarter deficit to eliminate Hoxie. The Knights then scored 20 consecutive points capped off by a Brady Dinkel touchdown pass to Noah Dreiling with six seconds remaining in the first half. Hoxie tied the game at 20 in the third quarter before Victoria regained the lead on one of Dinkel’s three touchdown runs. Ingalls 56, Stafford 6 – Ingalls scored 36 points in the second quarter to control the game against Stafford. Branson Sandoval rushed for four touchdowns, caught a touchdown pass, and returned a fumble for another score for the Bulldogs. Sharon Springs-Wallace County 46, Beloit St. John’s-Tipton 0 – Nate Klinge rushed for 119 yards and three scores as the Wildcats beat up on the injury-plagued Blujays. Eric Gfeller added 108 yards rushing and two scores for Wallace County.